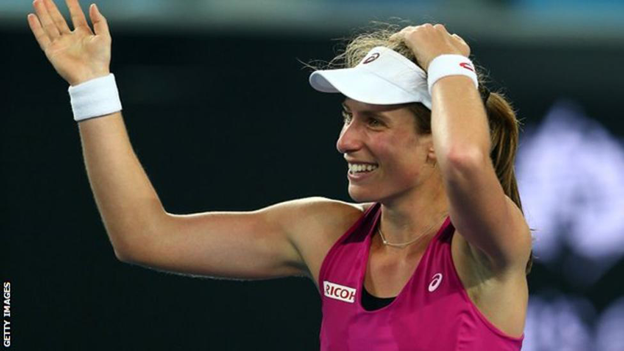 Johanna Konta became the first British woman to reach a Grand Slam quarter-final for 32 years by beating Ekaterina Makarova at the Australian Open. Konta, making her debut in the main draw, fought back to beat the 21st seed 4-6 6-4 8-6 in the fourth round. The 24-year-old, ranked 47 in the world, will next face either 15th seed Madison Keys or China's Shuai Zhang. The last British woman to play in the quarter-finals of a Grand Slam was Jo Durie, at Wimbledon in 1984. "It was mentally, emotionally and physically draining," said Konta, after a match that lasted three hours and four minutes. "Those four minutes were important, believe me. I left it all out there on court, ran after every single ball and was fortunate enough to capitalise on some opportunities." Konta had beaten her Russian opponent in their only previous meeting. That victory - in Eastbourne in June, when Makarova was ranked eighth in the world - was the Sydney-born player's first win against a top-10 player. Konta has beaten five top-20 players since reaching the fourth round at last year's US Open, and beat former world number one Venus Williams in the first round in Melbourne. In defeating Czech Denisa Allertova, Konta became the first British woman to make the fourth round of the Australian Open since Durie and Anne Hobbs in 1987.